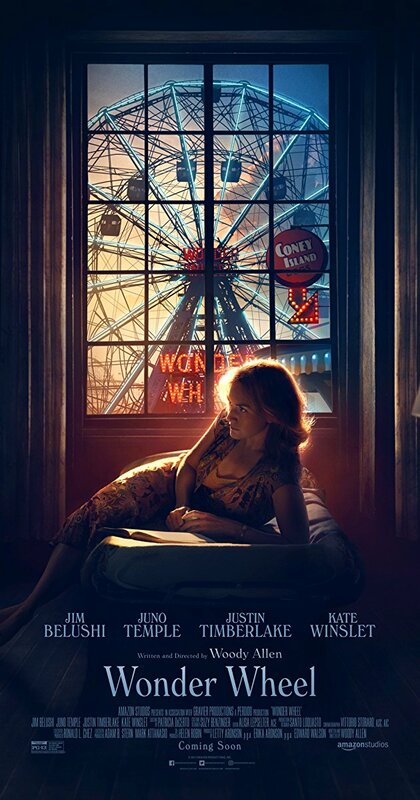 Imagine if someone took the form of O'Neil's The Iceman Cometh mashed it with William's Streetcar Named Desire and then added some jokes at the front and you'd have an approximation of how Woody Allen's WONDER WHEEL plays out. The practical result is an unwieldy and broken film that is striving to be more than an melodramatic romance. 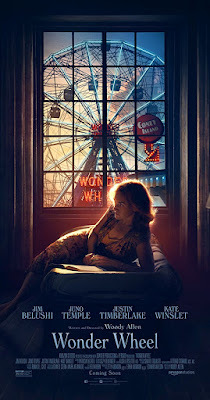 The plot of the film has Kate Winslet and Jim Belushi living a barely above water existence at Coney Island. She was once an actress who wrecked her her first marriage and her career with infidelity. He is a loveable shlub who is on the wagon thanks to her love. Unfortunately she feels trapped and is having an affair with lifeguard and would be playwright Justin Timberlake. Things become complicated when Belushi's daughter, Juno Temple, shows up. She'son the run from her husband, a mafia soldier, because she knows things which she told the FBI. She develops an interest in Timberlake as well. Told from Timberlake's perspective the film is shaded by his love of dark European plays and especially Eugene O'Neil with overly dramatic scenes, arch dialog and a sense of drama that is only found in over cooked artsy fartsy theater. Or at least I think that is what Allen is doing because I'm not sure. Some scenes play out realistically, but others, like Belushi and Winslet's home, are purely a construct. This is bad theater on the screen with dialog so awful it hurts your ears. No one talks like they do in most of the scenes. Watch the scene where Temple tells Winslet that Timberlake gave her a ride in the rain and you will cringe as WInslet goes on and on in ways that no living human being ever would about "Did he touch you? Did he take your hand?" Yes I know this is the 1950's but I've never seen anyone talk like that- even in O'Neil. The plotting of the film is extremely messy with plot threads left hanging and some bits used for comedic effect (I think) until they aren't. For example there is a plot line about Winslet's son from her first marriage starting fires. Its a joke at times until it's not. It's supposed to be a sign of the brokenness of the family but it is never integrated into the film because the character is always on the fringe and the only thing we know about him is that he burns things- constantly. Why is he in the film? I don't know, though I suspect that Allen may have had a longer story in mind which got cut down to 100 minutes. The performances are mostly good, though it is extremely hard to tell since the dialog and all of TImberlake's narration is shite. There are very few people who could make the words work but unfortunately no one in this cast is up to the task. Kate Winslet is being touted for an Oscar. I'm not sure that's going to happen with her mannered American accent and descent into Tennessee Williams style madness maybe the stuff of screen legends but it's also the sort of show-offy role that looks like she is trying way too hard. She is playing to the back row of the balcony, unfortunately she is on the big screen where that sort of thing doesn't work. For me and for many of the people I spoke with after the film the point at which the film utterly confused everyone is the turn into pitch black melodrama. Somewhere about the time Winslet's Ginny breaks apart (say the where Juno Temple tells her about the car ride) so does the film. The hystrionics go through the roof and what happens becomes midnight black. It's a semi unexpected turn that leaves one with ashes in ones mouth. It's a turn that might have worked had we been prepared or in another film but the films turning from comedy to drama to Iceman Cometh via a lead character who is in a piss poor road show production of Streetcar is too much to ask. ...though again I have to ask what was the script originally like because I suspect that this may have been something that worked on the page with out deletions. Is this a bad film? Perhaps, I'm not sure. I know it's not a good one. I know that the film is way too messy, broken and at times lazy (come on the mafia bad guys were on the Sopranos so they are comforting instead of scary) to be anything close to good. While I absolutely hate pretty much all of the dialog I find that I am drawn to the story. The theatrical story could have and should have worked in a better written script. Perhaps if Woody wasn't in a rush to do a film a year this might have worked (let's face it his need for quantity over quality hurts his films). Ultimately this is an interesting misfire (failure?) from a filmmaker who, even in his crashing and burning is at least trying to do something different.